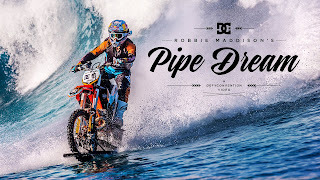 Movie Paradiso: Robbie Maddison's "Pipe Dream"
Watch Robbie Maddison's " Pipe Dream", DC shoes presents this videos giving a chance to witness "Maddo" racing his dirt beast through the salt water terrain of the Pacific Ocean. Robbie had spent nearly two years to to modify his bike to make this possible. Labels: Hollywood, Robbie Maddison's "Pipe Dream"